I have finally made a bread that the children will eat. I’m pretty good at making a worthy bread, all dense and full of seeds and activated currants and what have you. 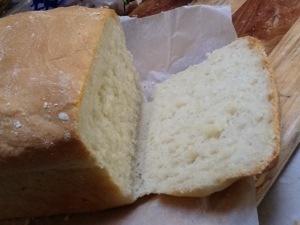 But my white bread also has traditionally come out a bit worthy, dense with a very crunchy crust. The kids just refuse to eat it. Even if it’s the only bread on offer they’ll eat almost anything else, corn crackers, cucumbers, expiring grapes, seaweed. 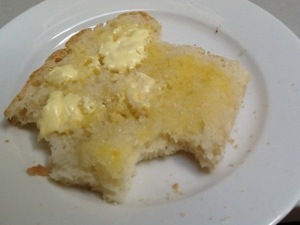 But this bread came out light and fluffy and everything they’ve ever wanted in a bread. I’m not sure where they acquired this bourgeois taste in bread, but I may have to cull their friend lists. It’s a recipe straight out of the Thermomix cookbook and I didn’t even tweak it much. Place in the Thermomix 180 grams of buttermilk, 200 grams of water, 20 grams of fresh yeast, a couple of turns of the sea salt grinder, 500 grams of flour and 10 grams of oil. I think the reason they put buttermilk in a few of their recipes is because you can actually make your own butter in the Thermomix, and you have buttermilk left over. You’d better believe it’s on my to do list. Put the lid on and mix for five seconds on speed 7. Yes, it does sound a little arbitrary, doesn’t it. Set the dial to the closed lid position and knead for three minutes on Interval speed. And that’s one of the many annoying things about this recipe book, the basic white bread recipe calls for half that kneading time. A focaccia recipe (seriously, is anyone making focaccia? Where’s the Turkish bread recipe?) gives a two minute knead time. Inconsistent. The dough is very sticky, I floured my hands before scraping it out. Place it in an oiled bowl and leave it in the oven covered with a damp tea towel with the light on for about half an hour, until it has doubled in size. Sling it into a lined loaf tin and back in the oven with the light on. I don’t cover it at this point, because I like to hop past and see how it’s going. This loaf rose a lot more than my white bread usually does. I baked it at 180 degrees for about forty minutes, you tap on it when it looks brown and it should sound hollow when done. Just look at that crumb. I baked it yesterday afternoon and it is still soft and delightful today, another win over my usual recipe which goes stale almost immediately. It makes an excellent piece of toast. One of the many things the kids have against home made bread is that they have to cut it themselves. It’s almost like living in the salt mines of Siberia, such a heartbreaking amount of manual labour. It’s got to be a good sign that even the Horror from Outer Space is chopping off chunks of it and eating it unadorned. “How is it?” I ask him. “I guess it’s OK”, he said, spraying me with crumbs. Praise indeed. What size loaf tin do you use? Quite a large one that I bought at that kitchen place that isn’t there any more at Norton Plaza. You want I should measure it? Or I make it into eight rolls, good for lunch boxes. Yes please, I only have normal loaf tins that aren’t that big. I will look for one that is the right size if you can give me dimensions.